Bacterial artificial chromosomes (BACs) have been used extensively for sequencing the human and mouse genomes and are thus readily available for most genes. The large size of BACs means that they can generally carry intact genes with all the long range controlling elements that drive full levels of tissue-specific expression. For gene expression studies and gene therapy applications it is useful to be able to retrofit the BACs with selectable genes such as G418 resistance, reporter genes such as luciferase, and oriP/EBNA-1 from Epstein Barr virus which allows long term episomal maintenance in mammalian cells. We describe a series of retrofitting plasmids and a protocol for in vivo loxP/Cre recombination. The vector pRetroNeo carries a G418 resistance cassette, pRetroNeoLuc carries G418 resistance and a luciferase expression cassette, pRetroNeoLucOE carries G418 resistance, luciferase and an oriP/EBNA-1 cassette and pRetroNeoOE carries G418 resistance and oriP/EBNA-1. These vectors can be efficiently retrofitted onto BACs without rearrangement of the BAC clone. The luciferase cassette is expressed efficiently from the retrofitting plasmids and from retrofitted BACs after transient transfection of B16F10 cells in tissue culture and after electroporation into muscles of BALB/c mice in vivo. We also show that a BAC carrying GFP, oriP and EBNA-1 can be transfected into B16F10 cells with Lipofectamine 2000 and can be rescued intact after 5 weeks. The pRetro vectors allow efficient retrofitting of BACs with G418 resistance, luciferase and/or oriP/EBNA-1 using in vivo expression of Cre. The luciferase reporter gene is expressed after transient transfection of retrofitted BACs into cells in tissue culture and after electroporation into mouse muscle in vivo. OriP/EBNA-1 allows stable maintenance of a 150-kb BAC without rearrangement for at least 5 weeks. BACs and PACs have proven very useful vectors for cloning fragments of mammalian DNA up to about 300 kb in size. They have been used extensively for the sequencing of the mouse and human genomes and the clones from these sequencing projects are available making almost the entire genomes available in ready sequenced clones. For gene delivery and expression in tissue culture, or for gene therapy, the large inserts of the BACs are very useful as they generally contain all the long range controlling elements needed for full levels and tissue specific expression of genes. In addition the inserts of the BACs can be subtly modified to include reporter genes or point mutations using homologous recombination in E. coli mediated by RecA [1–3], the RecET system [4–7] or the Red system (Redα/Redβ or exo/bet)[8, 9]. For tissue culture and gene therapy applications it is often useful to have mammalian selectable markers, reporter genes and other elements on the vector region of the BACs. It is possible to subclone the entire insert of the BAC into a modified BAC vector [10, 11] however, this involves cloning >100-kb fragments which is technically tricky. One can use homologous recombination mediated by RecA, RecET, or Red as described in the papers listed above. Alternatively one can use recombination of loxP sites mediated by Cre protein. We have chosen to use loxP/Cre recombination as all BACs and PACs carry convenient loxP sites and Cre only recombines loxP sites which should reduce unwanted rearrangements in the BAC insert. However, prior to insertion of DNA onto a BAC at a loxP site, it is necessary to remove or inactivate any high-copy origins from the retrofitting DNA as such an origin would make the BAC multicopy. Various methods for retrofitting new DNA at the loxP site using Cre recombinase have been developed. Kim et al, 1998, described a method in which the retrofitting plasmid is cut to remove the high-copy origin of replication and religated into a circle prior to in vitro recombination with purified BAC DNA using Cre protein followed by transfection into E. coli [12, 13]. An improvement is to use a retrofitting plasmid which has the gamma origin of replication from the R6K plasmid which only operates in an E. coli host which expresses the π protein (product of the pir gene) so that once the plasmid is retrofitted onto the BAC the origin is not functional in the DH10B E. coli host . The in vitro recombination with Cre tends to be rather inefficient and this can be overcome by expressing the Cre protein in the E. coli carrying the BAC so that recombination occurs in vivo. In one system, the Cre protein is expressed from the retrofitting plasmid itself in vivo. The Cre-expressing gene is however interrupted by the loxP site so that once recombination has occurred, no further Cre is expressed . Alternatively the Cre can be expressed from a separate plasmid that is co-transfected with the retrofitting plasmid, and then lost once retrofitting has occurred. This has been used to introduce an origin-less circle of DNA onto a BAC  or plasmids with the gamma origin onto BACs . Epstein Barr virus is maintained as a ~172 kb episome in a small proportion of B cells in most of the human population. The only viral elements needed for the episomal maintenance of plasmids in human cells is the latent origin of plasmid replication, oriP, and the viral protein EBNA-1. Plasmids carrying an oriP/EBNA-1 cassette can be maintained in human cells under selection for long periods of time. They are present at about 1–100 copies per cell and segregate by non-covalent attachment to the host chromosomes. When selection is dropped the episomes are lost at about 1–5% per cell division. There is much interest in using oriP/EBNA-1-containing vectors for gene therapy . The presence of oriP/EBNA-1 on gene expression vectors with reporter genes or mini-genes has been found to confer higher levels of expression and more persistent expression both in vitro and in vivo [19–22]. An oriP/EBNA-1 cassette is able to stabilize episomes up to 660 kb in size when these are shuttled from yeast by fusion with yeast spheroplasts [23, 24]. Finally it has been shown that therapeutically important genes can be expressed from the intact loci carried on large oriP/EBNA1-containing vectors, including β-globin , CFTR HPRT [17, 26] and α1-antitrypsin . Here we describe four new retrofitting vectors which allow addition of G418 resistance, luciferase expression and/or oriP/EBNA-1 to BACs, and a simple protocol based on those of Mejia and Larin, 2000 and Wade-Martins et al., 2001 for in vivo recombination with Cre. The luciferase gene on retrofitted BACs is expressed after transient transfection of cells in tissue culture and after electroporation of mouse muscle in vivo. A BAC carrying oriP/EBNA-1 was used to make stable cell lines which contained unrearranged BAC DNA after 5 weeks. A series of new vectors for retrofitting BACs was constructed (Fig. 1a). The vectors carry bacterial elements including the gamma origin of replication which only functions in bacteria expressing the π protein, a loxP site, and a spectinomycin resistance gene (Sp R ). In addition, they carry various mammalian elements. pRetroNeo carries a G418 resistance cassette (Neo R ). pRetroNeoLuc carries G418 resistance and a luciferase expression cassette (Luc). pRetroNeoLucOE carries G418 resistance, luciferase and an oriP/EBNA-1 cassette (OE). pRetroNeoOE carries G418 resistance and oriP/EBNA-1. Maps of the retrofitting vectors, BACs and the retrofitted BACs a) pRetro vectors; pRetroNeo, pRetroNeoLuc, pRetroNeoLucOE and pRetroNeoOE. Selected restriction sites are indicated. b) Retrofitting of standard BACs; pBeloBAC11, pBeloBAC11 retrofitted with pRetroNeo (pBeloBACRetroNeo), pBACe3.6, and pBACe3.6 retrofitted with pRetroNeoLucOE (pBACe3.6RetroNeoLucOE). NotI sites are indicated. c) Retrofitting of specific BACs; BACLucA, BACLucARetroNeoOE, BACGFPNeoOE, and BACGFPNeoOERetroNeoLuc. NotI sites are indicated. The following elements are labelled; spectinomycin resistance gene (SpR), gamma origin from the R6K plasmid (R6K ori), loxP site (LoxP), G418 resistance cassette (NeoR), luciferase expression cassette (Luc), oriP from Epstein Barr virus (OriP), EBNA-1 gene from Epstein Barr virus (EBNA-1), chloramphenicol resistance gene (CmR), F1 origin from the F factor (F1 ori), SacBII gene (SacBII), lacZ gene (LacZ) and EGFP expression cassette (eGFP). In order to retrofit the various pRetro plasmids onto a BAC, the plasmid is co-transfected into the BAC-containing bacteria along with a Cre-expression plasmid pJM2545 . pJM2545 contains a lacZ-cre fusion gene so that the Cre protein is expressed after IPTG induction. It also has a temperature sensitive origin that is functional at 30°C. As presented in Figure 2a, in vivo retrofitting of a BAC with the pRetro vectors occurs at 30°C and then the bacteria are grown at 42°C so that pJM2545 is lost. Growth on plates containing both chloramphenicol and spectinomycin allows selection for the retrofitted BACs. Figure 1b gives maps of the standard BAC vectors pBeloBAC11  and pBACe3.6 [29, 30] before and after retrofitting with pRetroNeo and pRetroNeoLucOE respectively. In vivo retrofitting of BACs a) The pRetro plasmids are cotransfected with a Cre-expression plasmid, pJM2545, into the BAC-containing E. coli. PJM2545 carries a temperature sensitive origin of replication (reptc) kanamycin resistance (KmR) and an inducible cre gene (Cre). Recombination between the loxP sites (LoxP) results in the retrofitted BACs which carry both chloramphenicol and spectinomycin resistance (CmR and SpR). b) Pulsed-field gel showing retrofitted BACs. BAC DNA was digested with NotI and separated on a pulsed-field gel. Lane 1) BACLucA, 2) BACLucARetroNeoOE, 3) BACGFPNeoOE and 4) BACGFPNeoOERetroNeoLuc. M indicates the Low Range PFG Marker from Biolabs. Sizes of the markers are indicated on the right. c) Pulsed-field gel showing BAC 4B19 retrofitted with pNELγ. DNA from BAC 4B19 (BAC) and the BAC retrofitted with pNELγ (BACNEL) was digested with NotI and separated on a pulsed-field gel. L indicates the 1 Kb DNA Ladder from GibcoBRL and M indicates the Low Range PFG Marker from Biolabs. The sizes of the markers are indicated on the right. Three BACs were retrofitted in this work. BACLucA carries 70 kb of alphoid DNA and already carries a luciferase gene on the BAC vector. This BAC was retrofitted with pRetroNeoOE to introduce both a G418-resistance gene andoriP/EBNA-1. NotI was used to determine whether retrofitting had occurred correctly. The unmodified BACLucA has a ~10-kb vector fragment while BACLucARetroNeoOE has a ~20-kb fragment (Fig. 1c and 2b). With a control plasmid the transfection efficiency was about 2000 colonies (2 × 104 per μg) and about 30 colonies were obtained on the retrofitting plates. 15/15 bacterial clones that were analysed showed the correct pattern of retrofitting. The insert of the BAC with 70 kb of alphoid DNA was unrearranged in all 15 BAC colonies analysed. In two of the 15 colonies, the bacteria contained both retrofitted and unretrofitted BAC DNA (data not shown). The second BAC, BACGFPNeoOE, carries a 130-kb random human DNA insert and has a GFP expression cassette, G418 resistance and oriP/EBNA-1 already on the BAC vector. It was retrofitted with pRetroNeoLuc to give BACGFPNeoOERetroNeoLuc. In this case the original 18-kb vector fragment is changed to two fragments of 22 and 3 kb (Fig. 1c and 2b). On control plates about 1000 colonies (104 per μg) were obtained while there were seven on the retrofitting plates. Seven colonies were analysed and 7 were correctly retrofitted but 1 had a rearrangement in the insert (data not shown). Thirdly, BAC 4B19 which contains about 150 kb of alphoid DNA in the BACe3.6 vector was retrofitted with pNELγ. This vector retrofits G418 resistance and EGFP expression and carries a loxP site and the gamma origin . The 8.7-kb vector fragment of BACe3.6 is replaced by fragments of 6.8 kb, 4.1 kb, 3.4 kb and 2.6 kb (Fig. 2c). 50 colonies were obtained, 6 out of 6 analysed had been correctly retrofitted but 5 out of 6 had deletions (up to 40 kb) in the alphoid DNA. In order to determine whether the luciferase gene on the retrofitting vectors was functioning before and after retrofitting, transient transfections were carried out into the mouse cell line B16F10 using PEI22. 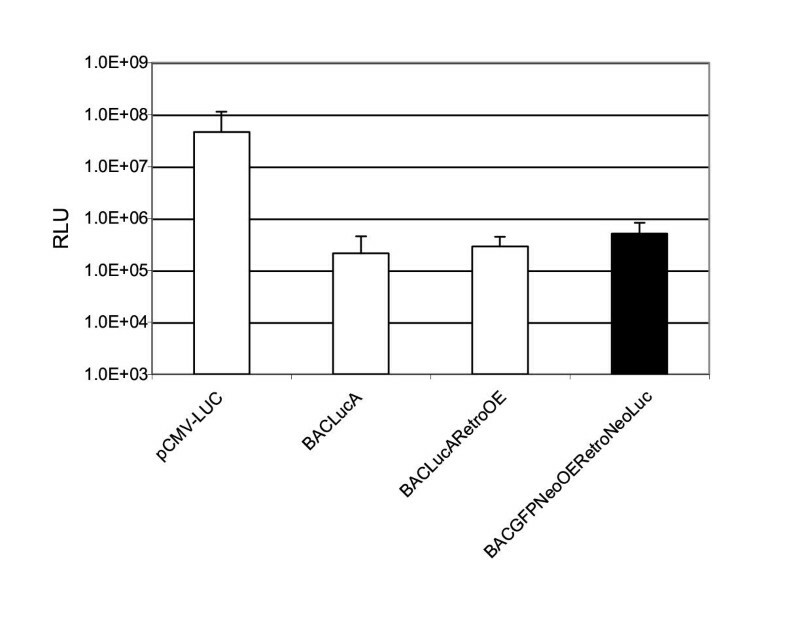 Transfections were carried out with 1 μg of the plasmids pCMV-LUC, pCIKLux, pRetroNeoLuc, and pRetroNeoLucOE, and 3 μg of the BACs BACLucA, BACLucARetroNeoOE and BACGFPNeoOERetroNeoLuc. Two separate experiments were carried out with triplicate samples and the results are shown in Figure 3. 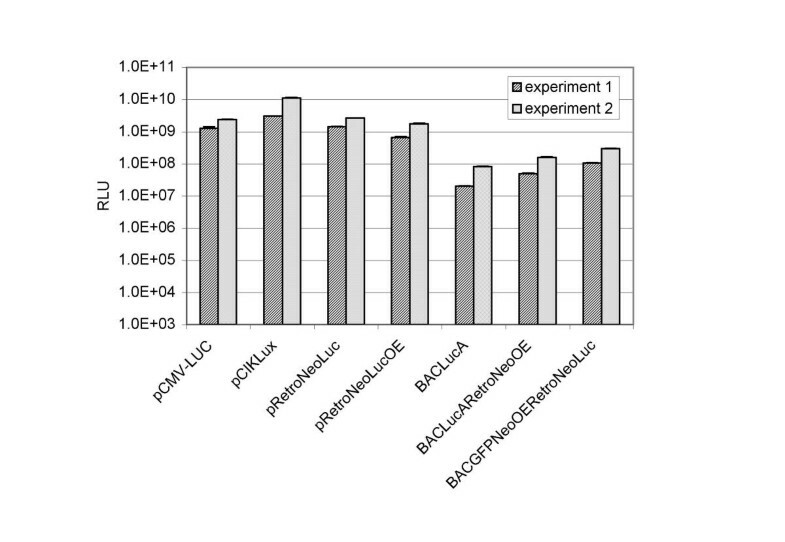 The retrofitting plasmids give almost identical luciferase expression to the control pCMV-LUC and pCIKLux plasmids. Expression of luciferase is approximately 25 fold lower when the BAC DNA is transfected. Three times the mass of BAC DNA as plasmid DNA was delivered, but the BACs are much larger (average 108 kb) than the plasmids (average 7.8 kb), so we were delivering approximately 1/5 the number of BAC as plasmid molecules. Therefore, the lower number of molecules (5 fold less) does not entirely account for the lower expression (25 fold less) from the BACs – we obtained an approximately 5 fold less efficient delivery of BAC DNA per molecule. In addition, it is clear that in these transient experiments assayed 24 hours after transfection, there is no difference between the corresponding constructs with or without oriP/EBNA-1 (pRetroNeoLuc versus pRetroNeoLucOE and BACLucA versus BACLucARetroNeoOE). Transient transfection showing the luciferase expression measured at 24 hours Plasmid (1 μg) and BAC (3 μg) DNA as indicated below the bars was transfected into the cells with PEI22. Two separate experiments were carried out. Each experiment was done in triplicate and the error bars indicate the standard deviation. To investigate delivery and maintenance of BACs carrying oriP/EBNA-1 elements, stable cell lines were generated with BACGFPNeoOE which carries oriP/EBNA-1 on the vector. Purified BAC DNA was delivered to B16F10 cells with Lipofectamine 2000 and six stable cell lines were selected with G418. After 30 days of culture under selection the percentage of GFP expressing cells was determined by FACs analysis (Fig. 4a). Between 63 and 98% of the cells in each cell line expressed GFP. Analysis of stable cell lines 0.5 μg of BACGFPNeoOE DNA was transfected into B16F10 cells with Lipofectamine 2000 and 6 clones were expanded in G418 selection. a) The percentage of cells expressing GFP was determined by FACs analysis at 30 days. B16F10 indicates untransfected cells. b) Analysis of DNA rescued from the 6 stable cell lines. DNA was extracted from the 6 cell lines and re-transfected into E. coli. DNA from 3 E. coli clones are shown for each B16F10 cell line as indicated above the lanes. Cell line number 2 gave rearranged BAC DNA in two E. coli clones, while the third is unrearranged. DNA was cut with SalI and resolved on a 0.3% SeaKem Gold agarose gel. Size marker M1 is the 1 kb DNA Ladder from Promega and M2 is the Lambda DNA-Mono Cut Mix from Biolabs. In between the two markers is the input BAC DNA cut with SalI. The sizes of the markers and BAC fragments are shown on the left and right of the gel respectively. c) Pulsed-field gel showing that the BAC DNA rescued from the cell lines is the same as the input DNA. The lanes carry; Low Range PFG marker (Biolabs)(M), input BACGFPNeoOE DNA cut with SalI (input), and DNA from three E. coli clones from cell line number 4 (4a, 4b and 4c) cut with SalI. The sizes of the markers and BAC fragments are indicated on the left and right of the gel respectively. In vivo delivery and expression of luciferase Twenty μg each of plasmid pCMV-LUC and BACs BACLucA, BACLucARetroOE, and BACGFPNeoOERetroNeoLuc DNA was injected and electroporated into mouse muscle. Luciferase expression was assayed 24 hours after gene delivery. Background levels in un-treated mice is about 50 RLU. After 35 days in culture, high-molecular-weight DNA was prepared from the six cell lines and electroporated into bacteria which were then grown on chloramphenicol-containing agar. DNA was extracted from 5 clones from each of the six cell lines, digested with SalI and analysed on an agarose gel (three are shown for each mammalian cell line in Fig. 4b). In 5 of the cell lines (1, 3, 4, 5 and 6) the BAC DNA extracted from the mammalian cells matched the input BAC DNA in all 5 E. coli clones. One cell line, number 2, gave some E. coli clones with rearranged BACs; of 8 clones analysed from this cell line, 4 were rearranged, always in the insert rather than the vector region, while 4 were unrearranged. To further investigate the rescued BAC DNA, a pulsed-field gel was used to fully resolve the BAC fragments for 3 of the clones from cell line 4 (Fig. 4c). It is clear that the SalI fragments of the rescued DNA exactly match the input DNA. The BAC DNA has therefore been Lipofected intact into the cells and maintained as episomes for 37 days without rearrangement. BAC DNA was also introduced into muscles in vivo by injection followed by electroporation. BACLucA, BACLucARetroOE and BACGFPNeoOERetroNeoLuc all gave approximately the same amount of luciferase expression, approximately 5 × 105 RLU, 24 hours after electroporation. Muscles from untransfected mice gave the same as background levels (about 50 RLU). The presence of oriP/EBNA-1 on the BAC does not make a significant difference to the level of expression at 24 hours (compare BACLucA and BACLucARetroOE). The control plasmid pCMV-LUC (5.9 kb) gave approximately 100 fold more luciferase expression than the BACs (average 108 kb). In this case the same mass of plasmid and BAC were electroporated so approximately 18 times as many copies of plasmid were applied indicating that BAC transfer is approximately 5 fold less efficient per copy. As all BACs carry a loxP site and do not carry the spectinomycin resistance gene these plasmids are of general use for retrofitting. G418 resistance allows selection of stable transformants in tissue culture, the luciferase expression cassette allows efficient quantitation of gene expression in tissue culture and in vivo while oriP/EBNA-1 allows stable maintenance as episomes in tissue culture and possibly in vivo. The in vivo retrofitting protocol is very efficient giving tens of colonies from a single electroporation. Almost all the colonies that grow contain the correctly retrofitted BAC. The only rearrangements observed were in the two larger BACs. The 70-kb insert consisting of alphoid DNA did not rearrange. The 130 kb of random human DNA rearranged very rarely while the 150 kb of alphoid DNA usually rearranged. Alphoid DNA consists of almost identical tandem repeats so the ability to retrofit the BAC with 150 kb of alphoid DNA without rearrangement is a stringent test of this system. The in vivo retrofitting works with both the new pRetro vectors and with the previously described retrofitting vectors pNELγ, which carries G418 resistance and EGFP, and pNELγI which carries also an I-SceI site for linearisation . In addition, the modular nature of the pRetro vectors allows other selectable markers or reporter genes to be easily added. Transfection of the retrofitting plasmids and retrofitted BACs with PEI22 showed that the luciferase was efficiently expressed. Expression from the BACs was only about 5 fold less per molecule than for the control plasmids indicating that the BAC DNA up to 155-kb in size is being delivered only moderately less efficiently than small plasmid DNA with PEI22. Stable transfection of a 150-kb BAC carrying oriP/EBNA-1 was used as a stringent test of the ability to transfect such large DNA intact into mammalian cells in tissue culture. 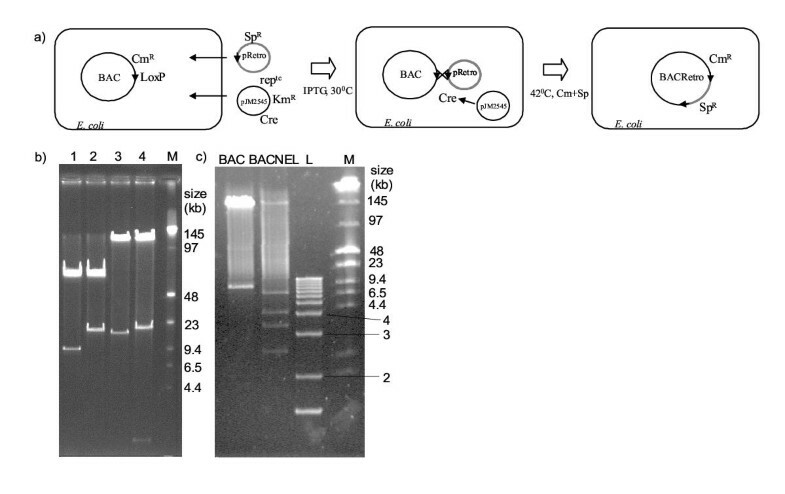 Rescue of episomal BAC DNA into E. coli is a quick and efficient way of determining whether the BAC DNA has been delivered and maintained intact . Delivery of the 155-kb BAC with Lipofectamine 2000 resulted in 5 out of 6 mammalian cell lines which carried only the intact BAC after 35 days in culture while the 6th had some rearranged and some intact BAC episomes. Other investigators have described intact delivery of similarly sized oriP/EBNA1-BACs. A 200-kb oriP/EBNA1-BAC was delivered with Lipofectamine but the intactness of the DNA was not analysed in detail and only pools of cell clones were analysed . A 117-kb oriP/EBNA1-BAC was delivered by calcium phosphate co-precipitation but only one cell line was described so the frequency with which such large DNA was delivered and maintained intact is not clear . In a further study, delivery of a 130-kb oriP/EBNA1-BAC with lipofectin/integrin-binding peptide/DNA (LID) complex resulted in only 2 cell lines out of many screened with the intact BAC DNA . In addition, a very effective viral packaging and delivery system has been described for oriP/EBNA1-BACs up to about 150 kb in size . Thus, Lipofectamine 2000 is the best of the non-viral delivery systems which have been used to deliver oriP/EBNA1-BACs intact. In vivo delivery by injection of DNA into muscle followed by electroporation with electric pulses of low field strength and long duration has been used to efficiently deliver plasmid DNA. The level of expression from plasmid DNA is generally 30–150 fold higher than with microinjection alone [32–36]. The expression obtained here with BAC DNA was only about 5 fold lower per molecule than with the plasmid DNA indicating that in vivo electroporation into muscle is a very effective method for delivering DNA up to at least 150 kb in size. The pRetro vectors allow efficient retrofitting of BACs with G418 resistance, luciferase and/or oriP/EBNA-1, by in vivo loxP/Cre recombination. The retrofitted BAC DNA can be efficiently delivered to cells in tissue culture and to mouse muscles in vivo and the luciferase gene is well expressed. The BAC DNA is transfected only about 5 fold less efficiently than plasmid DNA using PEI22 in vitro or electroporation into muscles in vivo. Lipofectamine 2000 allowed intact transfection of a 150-kb BAC into cells in tissue culture and the BAC was maintained as an oriP/EBNA-1 episome for 35 days without rearrangement of the DNA. Retofitting of BACs with these vectors should facilitate long-term gene expression from BAC clones for study of gene expression and for gene therapy applications. The 2.2-kb HindIII fragment carrying the spectinomycin resistance gene from pWM5  was cloned into the HindIII site of pBluescript II KS (Stratagene) to give pLP1S. The 1.1-kb XhoI-SalI fragment from pMC1neo Poly A (Stratagene) was cloned into the SalI site of pLP1S to give pLP3S. The 3.3-kb XhoI-EcoRV fragment containing the spectinomycin resistance and G418 resistance genes from pLP3S was cloned to a 700-bp XhoI-PvuII fragment carrying the gamma origin (R6K ori) and loxP site from pUni/V5-His-TOPO (Invitrogen) to give pRetroNeo. The host bacteria for pRetroNeo and all the other pRetro vectors were PIR1 cells (Invitrogen). A 3-kb BglII-NaeI (BglII end blunt ended with Kenow +dNTPs) from pCIKLux  carrying a luciferase expression cassette was cloned into pRetroNeo cut with KpnI (and the ends blunt ended with Klenow without dNTPs) to give pRetroNeoLuc. 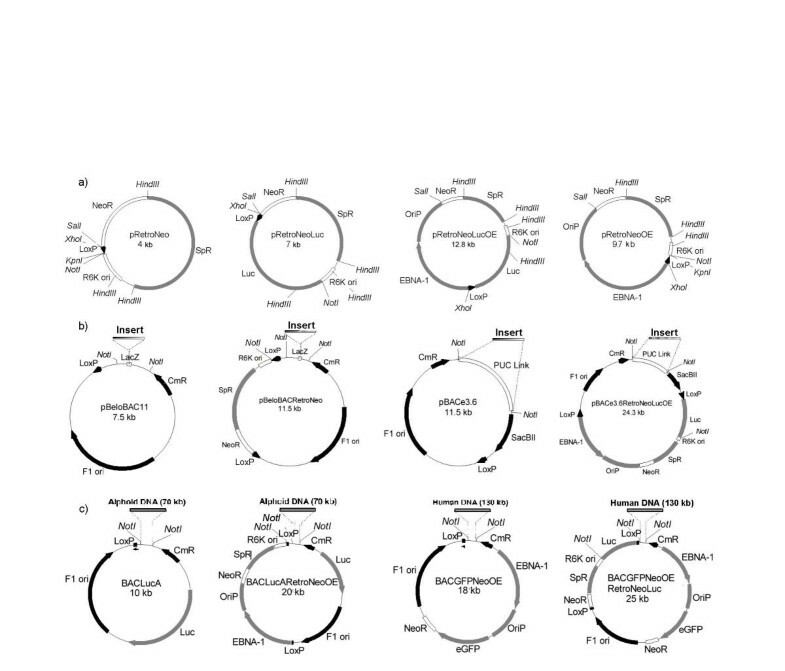 The plasmid pCIKLux consists of 1.6 kb of luciferase ORF from pGL3 (Promega) cloned into pCI (Promega) so that it is driven by the CMV promoter and enhancer. The 5.7-kb SalI-FspI fragment from pCEP4 (Invitrogen) carrying the oriP/EBNA-1 cassette was cloned into SalI-PvuII cut pSP73 Vector (Promega) to give pSP73OE. The 5.7-kb SalI-XhoI fragment from pSP73OE carrying oriP/EBNA-1 was cloned into pRetroNeoLuc cut with SalI to give pRetroNeoLucOE. The 5.7-kb SalI-XhoI fragment from pSP73OE was also cloned into SalI cut pRetroNeo to give pRetroNeoOE. The control plasmids pCMV-LUC  and pCIKLux  were also used in transfections. BACLucA has a vector based on pBeloBAC 11  but with a luciferase expression casette (pLUCBAC)  and then 70 kb of alphoid DNA from pPAC4-7c5  cloned into the vector. The vector of BACGFPNeoOE is also based on pBeloBAC 11 but also has a GFP expression cassette, G418 resistance and oriP/EBNA-1. The insert of BACGFPNeoOE is a random 130-kb human insert . BAC 4B19 has a pBACe3.6 vector  and contains about 150 kb of alphoid DNA. To make the BAC-containing bacteria electrocompetent, 99 ml of LB with 12.5 μg/ml chloramphenicol was inoculated with 1 ml of saturated culture of the bacteria and grown for about 3 hours at 37°C with shaking till an OD600 of 0.6–0.8 was reached. The culture was cooled down on ice for 30 min. Two lots of 50 ml were spun down at 3,000 rpm (Sorval) for 15 mins at 4°C, rinsed twice with 10 ml ice cold water, washed (with resuspension) with ice cold 10% glycerol and finally resuspended in 250 μl (per 50 ml of bacterial culture) of ice cold 10% glycerol. Then aliquots of 40 μl per 1.5 ml tube were snap frozen with liquid nitrogen and stored at -70°C or used directly. 100 ng of the retrofitting plasmid and 100 ng of pJM2545  were electroporated into the bacteria using 1 mm cuvettes and a BioRad electroporator (Gene Pulser II) at 1.8 kV, 25 μF and 200 Ohm. 1 ml of LB with 0.5 mM IPTG was added and incubated at 37°C for 1 hour with shaking. The bacteria were spun down and plated in total on an LB plate with 12.5 μg/ml chloramphenicol and 50 μg/ml spectinomycin. The plates were incubated at 30°C for 75 minutes and then at 42°C overnight. BAC DNA for transfection was prepared with Qiagen EndoFree Plasmid Mega Kit (without using the QIAfilter Cartridges supplied in this Kit). Cultures of BACs were grown overnight at 37°C in 2.5 L of LB medium containing 12.5 μg/ml chloramphenicol. The bacteria were harvested in 500 ml aliquots by centrifugation for 20 min at 4°C and 6,000 × g in a Sorvall GS3-Rotor. The pellet was resuspended in 200 ml ice-cold buffer P1. 200 ml buffer P2 was then added and mixed gently but thoroughly by inverting the tube 4–6 times. The mixture was incubated at room temperature for 5 min. 200 ml ice-cold buffer P3 was added, mixed gently but thoroughly by inverting the tube 4–6 times, and the mixture incubated for 30 min on ice. The mixture was centrifuged at 20,000 × g for 30 min at 4°C. The supernatant containing the BAC DNA was removed and re-centrifuged at 20,000 × g for 15 min at 4°C. The supernatant containing the BAC DNA was transferred into a fresh bottle and 50 ml of buffer ER added, mixed gently but thoroughly by inverting 10 times, and incubated on ice for 30 min. A QIAGEN-tip 2500 was equilibrated by adding 35 ml QBT buffer and allowing the column to empty by gravity flow. The DNA solution was loaded onto the QIAGEN-tip and allowed to enter the resin by gravity flow. The QIAGEN-tip was washed with 4 × 50 ml buffer QC. The DNA was eluted with 5 × 7 ml buffer QN (preheated to 65°C). The DNA was precipitated by adding 24.5 ml isopropanol, followed by centrifugation at 15,000 × g for 30 min, 4°C. The supernatant was carefully decanted and the DNA washed with 7 ml endotoxin-free 70% ethanol at room temperature. The tube was immediately centrifuged at 15,000 × g for 10 min, 4°C and the supernatant carefully decanted without disturbing the pellet. The pellet was air dried for approximately 10–20 min and the DNA re-dissolved in 1–2 ml endotoxin-free TE-buffer over night at 4°C. The DNA was re-suspended and subsequently handled using pipette tips for genomic DNA (Biozym Art 200 G or 1000 G). B16F10 (kindly provided by I. J. Fidler, Texas Medical Center, Houston, TX, USA) murine melanoma cells were grown in DMEM media 10% FCS, at 37°C with 5% CO2. Transient transfections were carried out with PEI22 (MBI Fermentas, St. Leon-Rot, Germany). Cells were seeded in 6-well dishes (5 × 105). 24 hours later, 1 μg (plasmid) or 3 μg (BAC) DNA was diluted in 250 μl HBS buffer (20 mM HEPES, 150 mM NaCl, pH 7.4). Then 0.98 μg PEI22 per 1 μg DNA was diluted in 250 μl HBS. The DNA/PEI solution was mixed by pipetting the solution up and down approximately 10 times and then incubated for 30 min at room temp. The old medium was removed from the cells and 1.5 ml of OPTIMEM added to the cells. The transfection mix was then added to the cells and left to incubate for four hours. The medium with the complexes was removed and fresh full growth medium added to the cells. After overnight incubation the cells were assayed for luciferase or GFP expression. Stable transfections were carried out with Lipofectamine 2000 (Invitrogen Life Technologies). Cells were seeded in 6-well dishes (2 × 105) the day before transfection. Two μl of Lipofectamine 2000 was diluted in 250 μl OPTIMEM, mixed and incubated for 5 min at room temp. 0.5 μg BAC DNA was diluted in 250 μl OPTIMEM and mixed. The Lipofectamine 2000/OPTIMEM was added rapidly to the DNA/OPTIMEM solution and mixed by pipetting up and down approximately 10 times. The transfection complexes were incubated for 30 min at room temp. The old medium was removed from the cells and 1.5 ml of OPTIMEM added to the cells. The transfection mix was added to the cells and left to incubate for three hours. The medium with the complexes was removed and fresh full growth medium added to the cells. After an overnight incubation, the cells were trypsinized and 1/16 of the cells seeded onto each of 4 separate 10-cm tissue culture plates. The medium was replaced on day 3 with fresh medium containing 800 μg/ml G418. The selective medium was replaced on day 6 and 9. On day 10 colonies were picked into 24 well plates. On day 14 they were transferred into T25 flasks and from then on passaged twice a week (twice at 1:5 dilution and thereafter at 1:10). GFP expressing cells were counted at day 30 and DNA preparations were carried out at day 35. Luciferase assays were carried out on transiently transfected cells and on mouse organs. For transiently transfected cells, the culture medium was removed from the 6-well dish and the cells were washed once with PBS. The cells in each well were lysed with 1 ml of lysis buffer (25 mM Tris-Phosphate pH 7.8, 2 mM DTT, 2 mM CDTA (trans-1,2-diaminocyclohexans-N,N,N',N'-tetra-acetic acid), 1% Triton-X100, 10% glycerol) for 5 minutes and snap frozen in liquid nitrogen. For mouse muscles, approximately 200 mg from the right upper thigh muscle of treated mice were dissected 24 hours after electroporation and placed into 600 μl of ice cold 250 mM Tris-HCl pH 7.8. The tissue was homogenised on ice for one minute using an IKA Ultra-Turrax homogenizer. Samples were snap frozen in liquid nitrogen immediately and stored at -80°C. Samples were rapidly thawed in a waterbath at 37°C and immediately centrifuged for 10 min at 15,000 rpm and 4°C. For measurement, 350 μl assay buffer (25 mM glycyl-glycin pH 7.8, 15 mM MgSO4, 5 mM ATP) and 10 μl of cell lysate or 50 μl of supernatant of organ homogenate were mixed in a Sarstedt (No. 55.476) tube and luciferase activity was quantified using a LUMAT LB 9507 (Fa. Berthold, Bad Wildbad, Germany). To do this, 300 μl of injection buffer (20 mM glycyl-glycine pH 7.8, 0.2 mM sodium salt of D-Luciferin (SIGMA)) were added and light units were measured for 10 seconds. Luciferase assay background (approximately 50 light units) was subtracted from each value. One million light units correspond to approximately 2 ng luciferase. Counts shown in the figures were calculated as RLU (relative light units) per transfection sample or RLU per organ in total. For counting GFP-expressing cells, cells were trypsinized, fixed with 2% paraformaldehyde in PBS for 45 minutes at room temperature, washed twice in PBS and counted with a BD LSR (Beckton Dickinson) FACs using Cell Qest software. In order to determine whether the oriP/EBNA-1 BACs were intact in the mammalian cells after 5 weeks culture, high-molecular-weight DNA was prepared from the cell lines and electroporated into bacteria. To prepare high-molecular-weight DNA, cells were harvested by trypsinisation, suspended in full media, washed twice with PBS and suspended at 4 × 107 cells per ml in PBS. The cell suspension was warmed to 42°C and mixed with 1 volume of 1.5% low-melting agarose (Sigma) in 0.125 M EDTA pH 8.0 equilibrated to 42°C. The mixture was then aliquotted into 75-μl plugmolds (BioRad) and left for 5 minutes on ice. The plugs were then transferred into a 1.5 ml tube with 500 μl of NDS solution (1% N-lauroyl sarcosine, 10 mM Tris-HCl pH 7.8, 0.39 M EDTA, 2 mg/ml proteinase K added freshly) and incubated for 1 hour at 55°C. The NDS solution was removed and the plugs were washed three times with EDTA mix (50 mM EDTA, 10 mM Tris-HCl pH 7.5) at room temperature for 30 min each wash. They were then washed twice with 1 × agarase buffer (NEB) on ice for 30 min each wash.
For electroporation into E. coli, a plug was melted at 65°C for 10–15 min, cooled to 45°C for 5–10 min and 1 μl agarase (NEB) added per plug. The plugs were incubated for 1 hour at 42°C and diluted with 1 volume of sterile water. Two μl of the DNA solution was electroporated into 40 μl DH10B ElectroMax bacteria (Invitrogen Life Technologies) using a BioRad GenePulser with 0.1 cm cuvettes and 2.5 kV, 25 μF, and 100 Ohm. 1 ml of SOC medium (Gibco) was added and the bacteria incubated with shaking at 37°C for 1 hour. Bacteria were plated out onto LB with chloramphenical at 12.5 μg/ml. Conventional agarose gels were carried out using 0.3% SeaKem Gold Agarose (Biozym) in 1 × TAE. Gels were run in 1 × TAE at a constant voltage of 80 V for two to three hours in standard horizontal agarose electrophoresis cells (Biorad). Pulsed-field gels were carried out using ultraPURE agarose (Gibco) at 1% in 0.5 × TBE. Gels were run in 0.5 × TBE at 14°C for 18 hours over night, with a fixed angle of 120°, switching times from 5 sec to 1 sec and 5.9 V/cm using a Chef-DRIII and a Mini Chiller model 1000 with a variable speed pump (BioRad). Gels were stained with ethidium bromide and the DNA was visualised with UV light. BALB/c mice were anaesthesised and the right leg was shaved. 20 μg of plasmid or BAC DNA was diluted in 50 μl of 150 mM NaCl and injected into the right upper thigh muscle. The muscle was immediately electroporated with a two needle electrode device (5 mm distance between electrodes; Genetronics, San Diego) placed on either side of the injection site. Three pulses of 90 V for 25 ms and then three more pulses of 90 V for 25 ms in the opposite orientation were applied with a square wave pulse generator (BTX, San Diego). Three animals were electroporated for each type of DNA and the error bars show standard deviations. All mice work was carried out according to local ethical committee guidance. We would like to thank Milena Kalat and Susanne Schüller for providing their knowledge and experience concerning in vivo electroporation, Ralf Kircheis, Birgit Smrekar and Lionel Wightman for helpful discussions and Malgorzata Kursa, Vanessa Rössler and Aleksandra Sinski for excellent technical assistance (Boehringer Ingelheim Austria). We thank Adam Baker (at present Decode, Iceland) for the gift of BACLucA and BACGFPNeoOE and Sebastian Carotta for helpful remarks concerning experimental details (Institute of Molecular Pathology, Vienna). This work was supported by EU Training Network HPRN – CT-2000 – 00089 (MAKEMAC). C. M-L. made pRetroNeoLuc, pRetroNeoLucOE and pRetroNeoOE, retrofitted BACLucA and BACGFPNeoOE, designed and carried out all the transfections, gene delivery and rescue of BAC DNA. G. K. made pRetroNeo, developed the in vivo retrofitting protocol and retrofitted BAC B419. L. D'A. provided the protocol for DNA rescue into E. coli. E. W. and C. H. designed and supervised this investigation. All authors read and approved the final manuscript.